After the disappointment of the English muffins (stupid philandering Paul Hollywood), a bake that’s altogether prettier, tastier, and much less stressful to make. 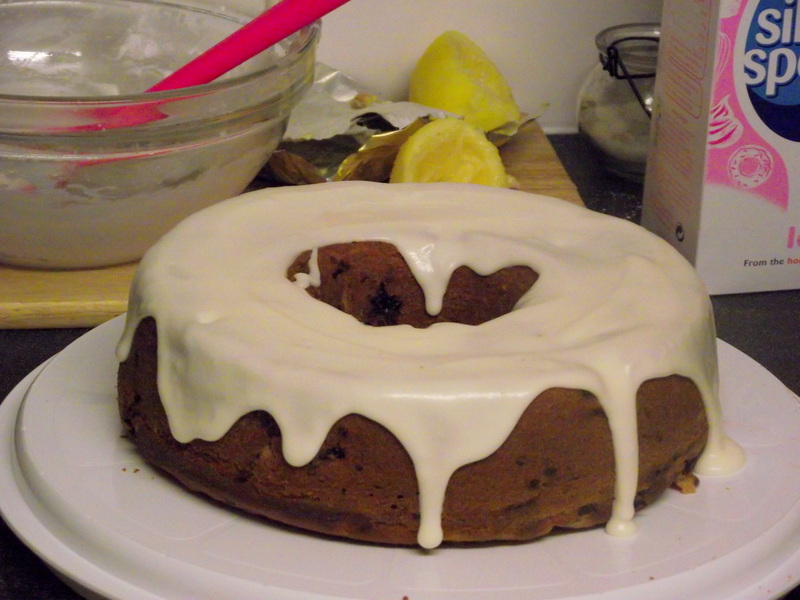 If you have a bundt pan it would look much more beautiful in that, but a tube pan or two loaf tins work just as well. 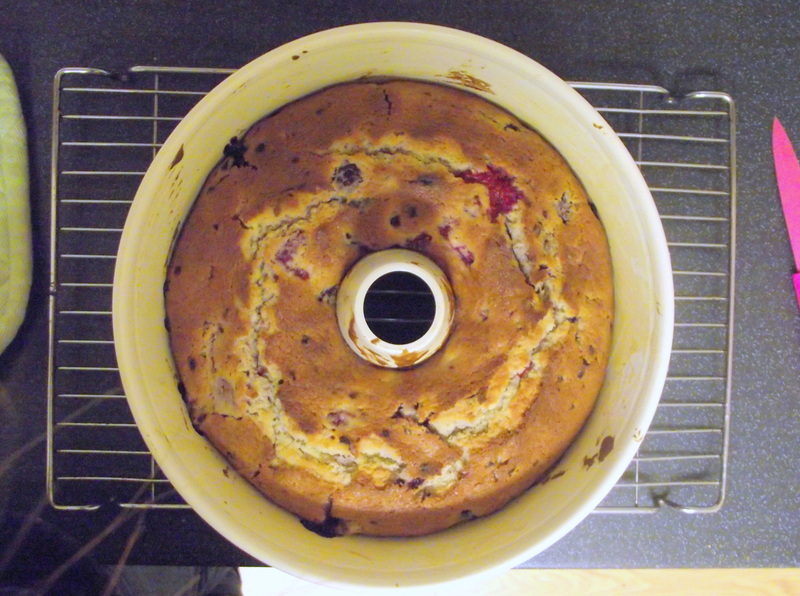 This is basically Smitten Kitchen’s Triple Berry Buttermilk Bundt recipe, but I happened to have some blackberries and added some raspberries as well for a double berry cake. You can do what you like! Hurrah! 1. Sift together the 350g flour, baking powder and salt and set aside. 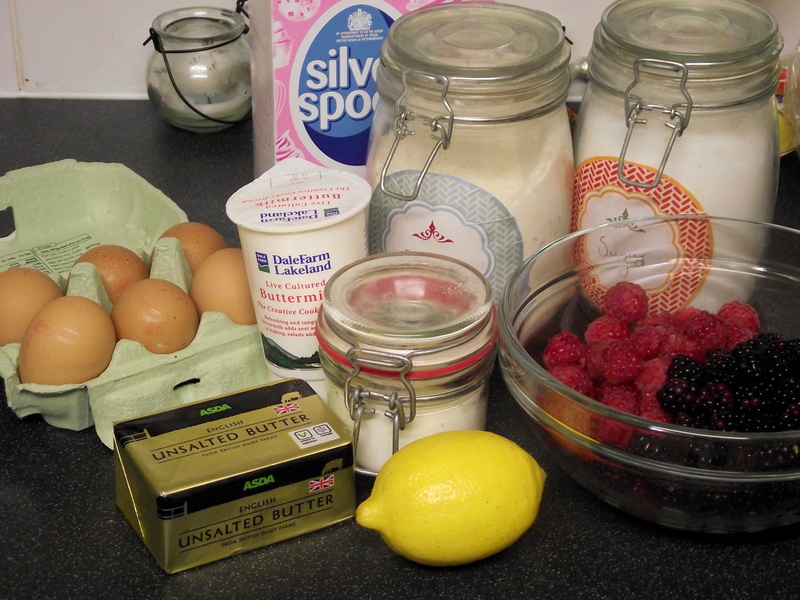 Cream together the butter, sugar and zest until light and fluffy, then add the eggs one at a time. Beat in the vanilla. 2. 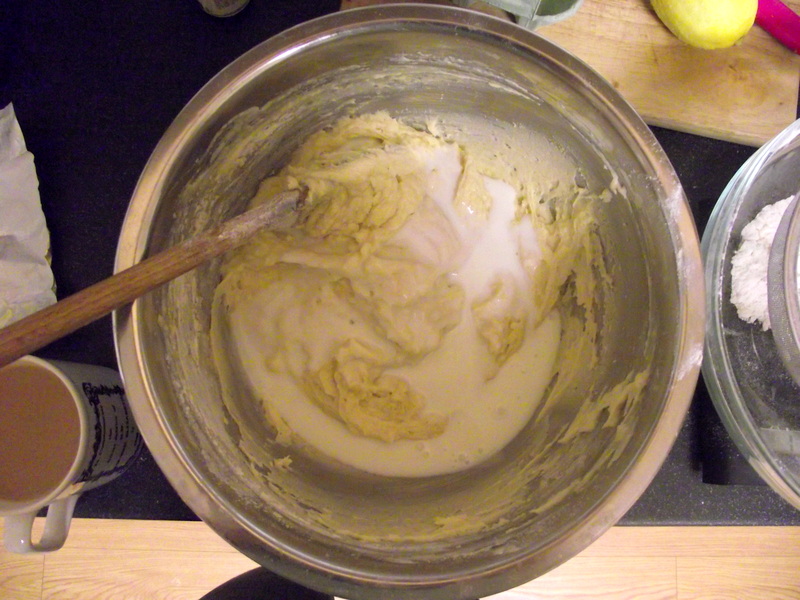 Gently stir in 1/3 of the flour, then half the buttermilk, and alternate until everything is combined. 3. 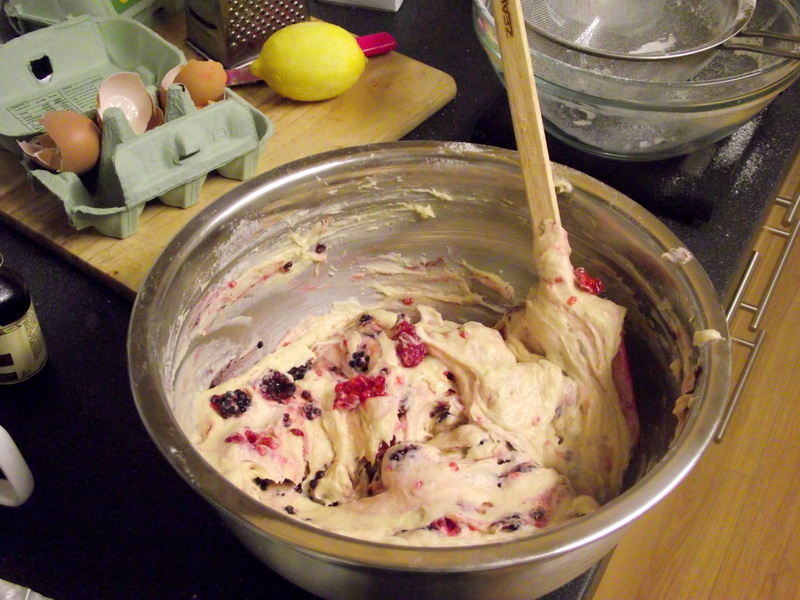 Coat the berries in the remaining flour to prevent them sinking in the batter, then fold them into the mixture as gently as possible with a spatula. 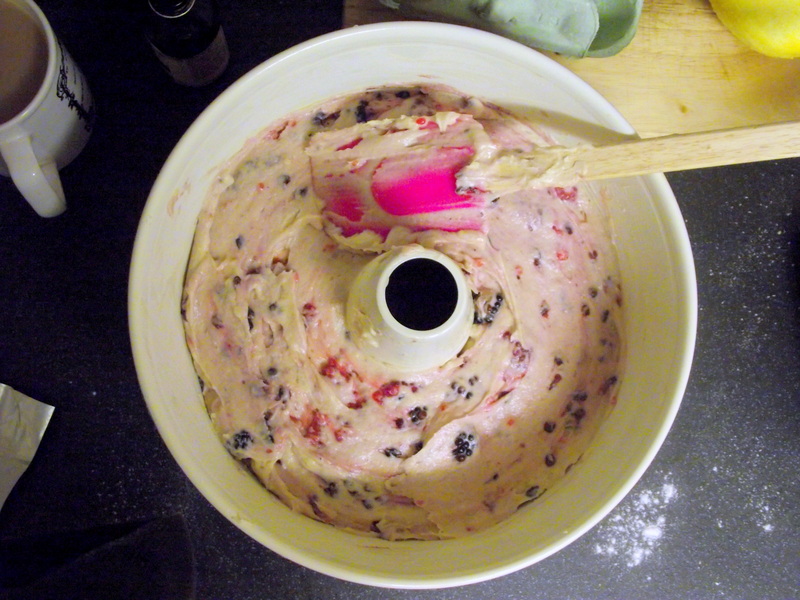 At this point the mixture will be very thick, and beautifully pink from the berries. 4. Spoon into your prepared tin, and bake at 180C for 55-60 minutes. I took mine out a little early, and in retrospect it was a tad underdone. 5. When cool, mix together the icing ingredients and drizzle over the cake. Your bundt cake is studded with so many gems! 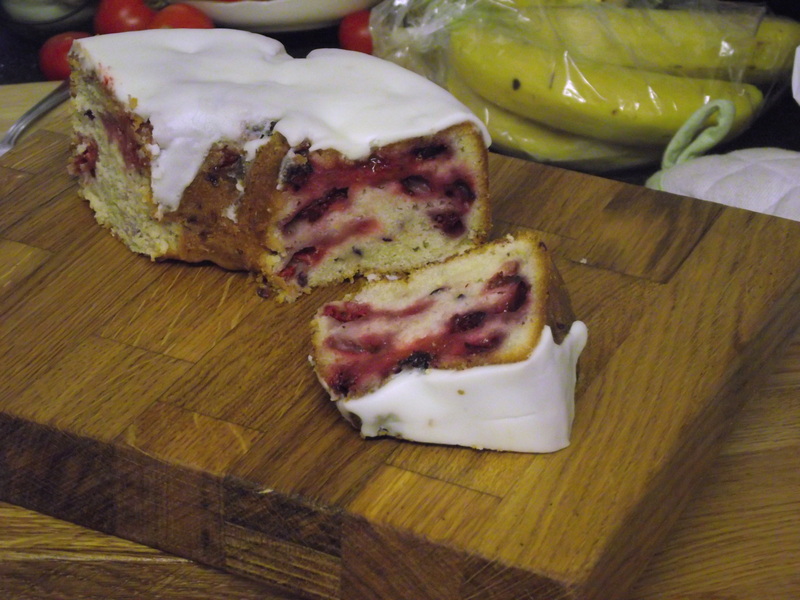 Your cake looks very moist and delicious, thanks for sharing the recipe!